The Leaders of the Future Academy (to give it its full title) is for civil servants at Executive Office level and below, and its aim is to help people develop the skills and confidence to progress in their careers. Her next step was to work on a team to help school children learn life skills as part of a six-week Inspiring Young People project. Mags’ latest involvement was managing a project for the first time. Evaluation is in progress at the moment, so we’ll tell you more about that in the future. Meanwhile, Mags has been full of praise for the enthusiasm and commitment of her colleagues on the team who worked so hard to make the project a success. 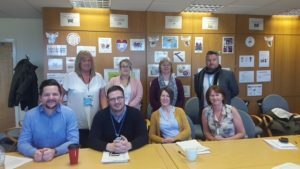 Civil Service Local volunteers still have their normal ‘day jobs’ to do while they are involved in a project, and finding a way to manage the extra load is one of the skills that they learn. Mags has benefitted from the opportunity. She said: “On a personal note, the skills I take away from this project will be invaluable to me and the business area I work in. I can honestly say it has been amazing - it has made me stronger than I ever imagined I could be! Who knows where Civil Service Local will take you?